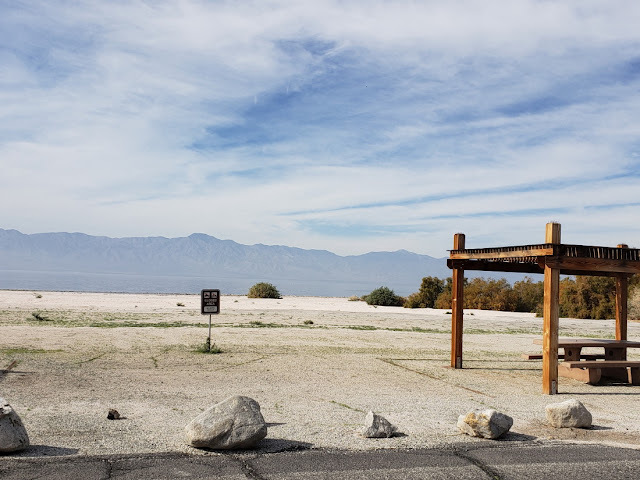 So, we have sidestepped the Salton Sea a few times. This time we decided to stop and see(the sea) and what it was all about. Not much happening these days because the sea has been evaporating and turning quite salty. But--back in the 1950's or so, the highway was crowded with vacationers and weekenders with swimming gear, boats, and fishing gear. Even the migrating birds are now finding it hard to find fish that have survived the super salty water. This is the beach area and the sea is well beyond. The Salton Sea is still the largest lake in California , even with the evaporation. It was created by a break in a canal back in 1905. The water flow created this 340 plus square miles of saline lake. For years it was a stop for millions of migrating birds. But now, because inflow from some sources has been diverted and from evaporation, the salinity has all but stopped migrating birds and killed off the fish , like tilapia, that they fed on. Things we don't think about. 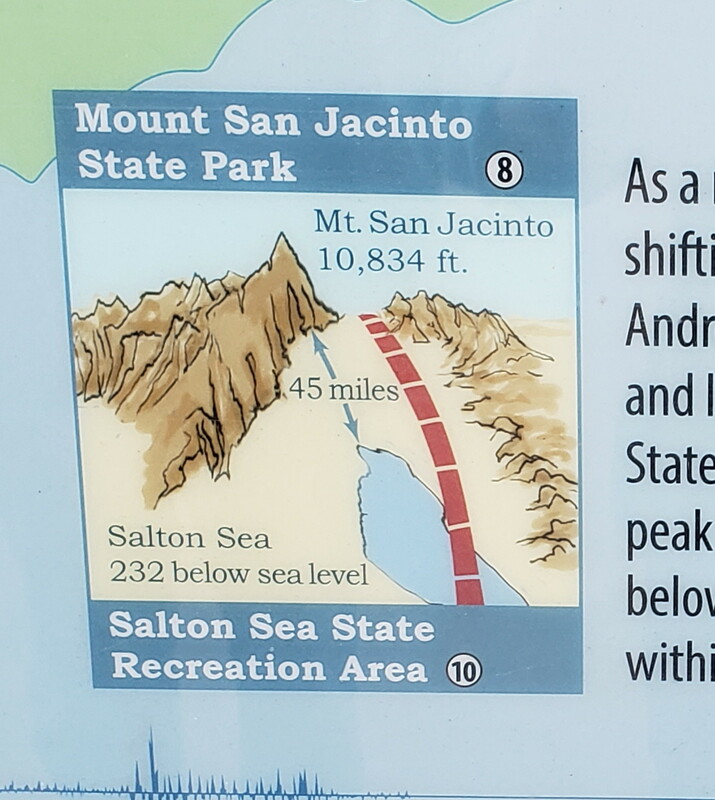 The San Andreas Fault line passes through this area. the Salton Sea , only 45 miles away at 232 feet below sea level. 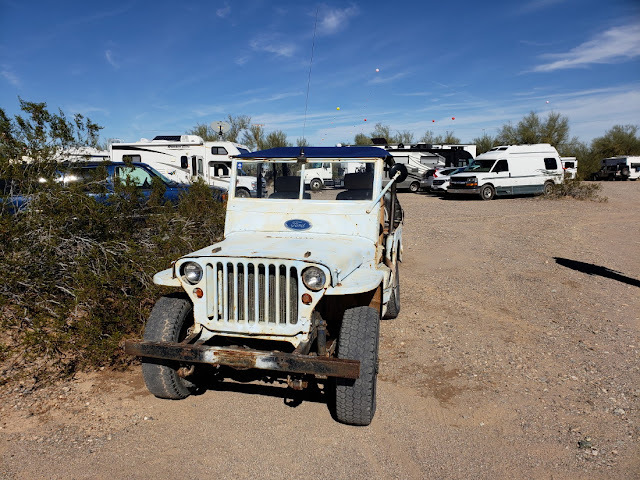 Whenever we meet with western RVers, we often have heard about Slab City. 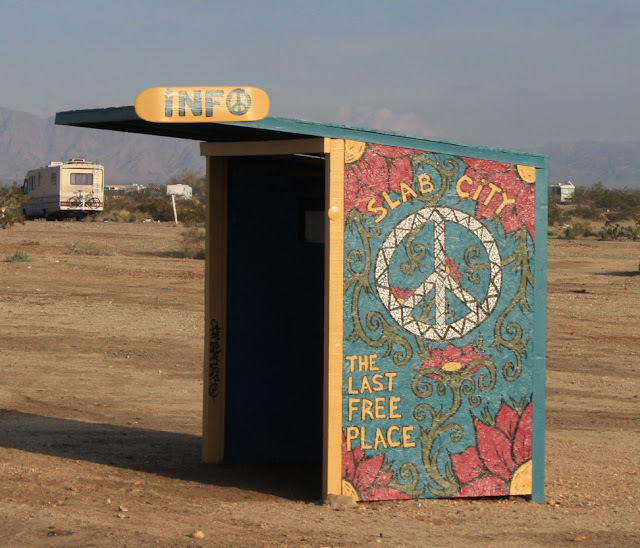 Everyone seems to say that you need to see Slab City. Well we stopped by. A very unusual place . An old military base now inhabited by boondocking citizens. 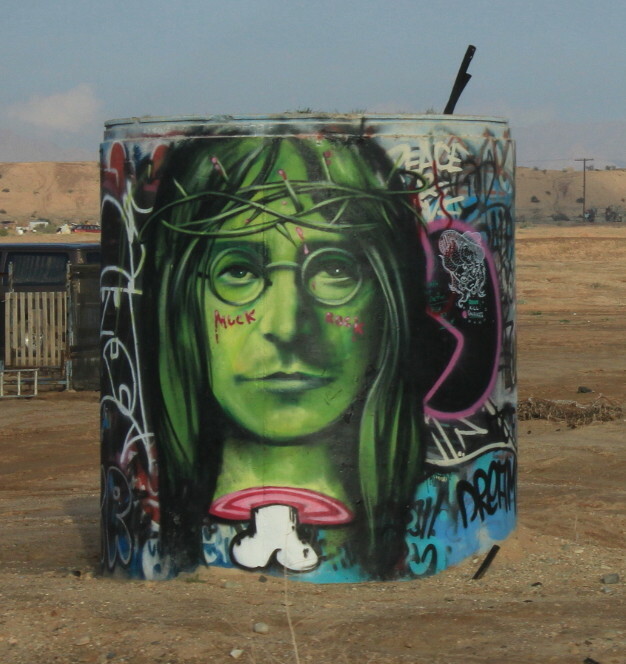 The most notable is Salvation Mountain, created by one man and has become an icon for Slab City. But these days the area is looking more trashy than ever. We visited, but decided not to stay. Heading north from Salton Sea, a few date palms. 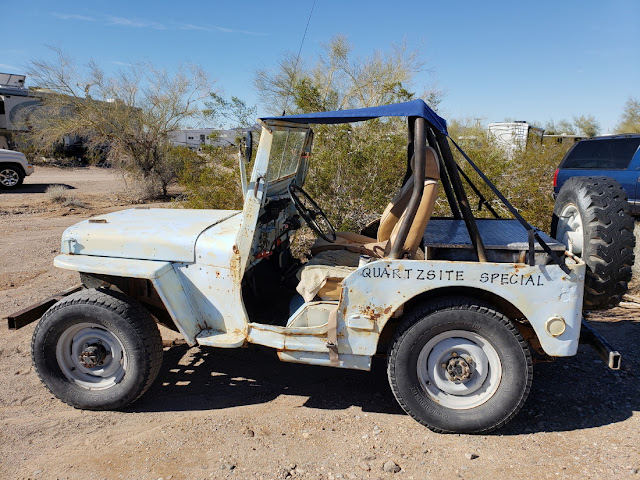 It was so great to see friends once again at Quartzsite, Arizona LTVA. The last time was two years ago. Above is a small section of our Lazy Daze group. Over 21 units this year. Still some great pot luck dinners and evening fires. Thank you to Roger again for hosting. When we arrived the LTVA was officially closed because of the government shutdown. 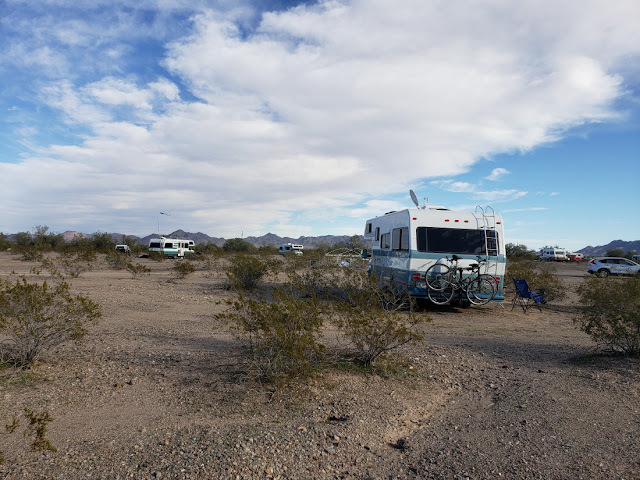 However, with the help of volunteers and the town of Quartzsite, campers were welcome and the water and dump station and dumpsters were functioning. 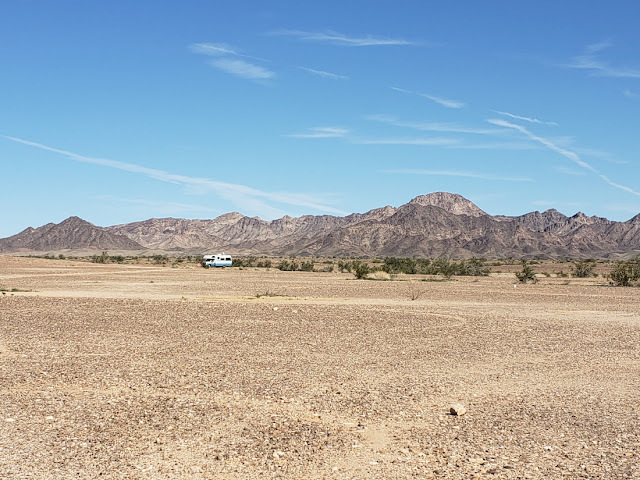 Before the week was done , the government reopened and most of the campers paid their $40 for14 days of camping with access to water and dump station. Heading to the RV show tent . This year it is an antique Jeep. I have a hard time telling the year on Jeep vehicles, but this one was definitely older. Over by the Tyson Wells section of vendors is this rugged unit. It is built on a Fuso truck body. Fuso is based out of Japan, but is now mostly owned by Daimler, a German company. They do distribute in the U.S. 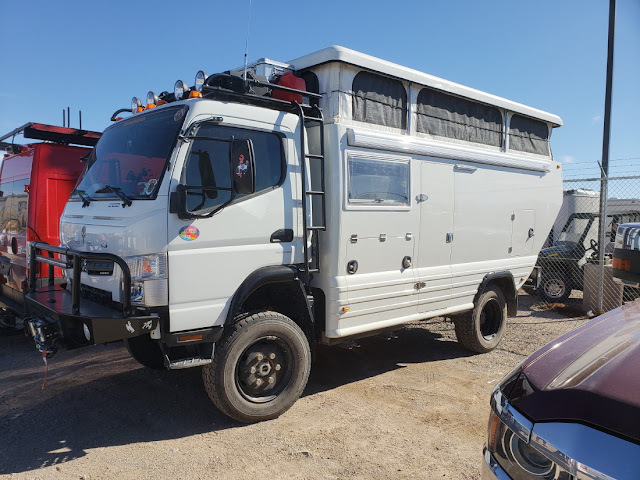 This is a very high clearance boondocking RV. This might be classified as a Class C or a Truck camper, but the camper body is permanently fixed to the frame. 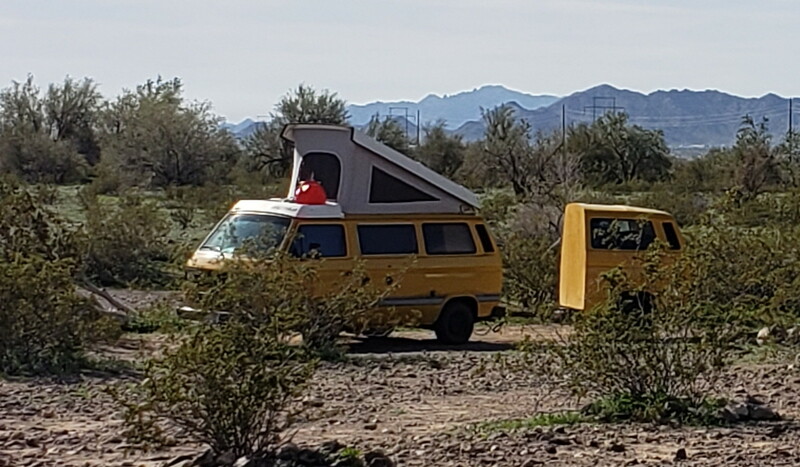 Note the top is similar to a popup truck camper. Also comes with storage over the cab, a winch, and probably much more. This monster tractor truck was attached to an equally painted and huge trailer. 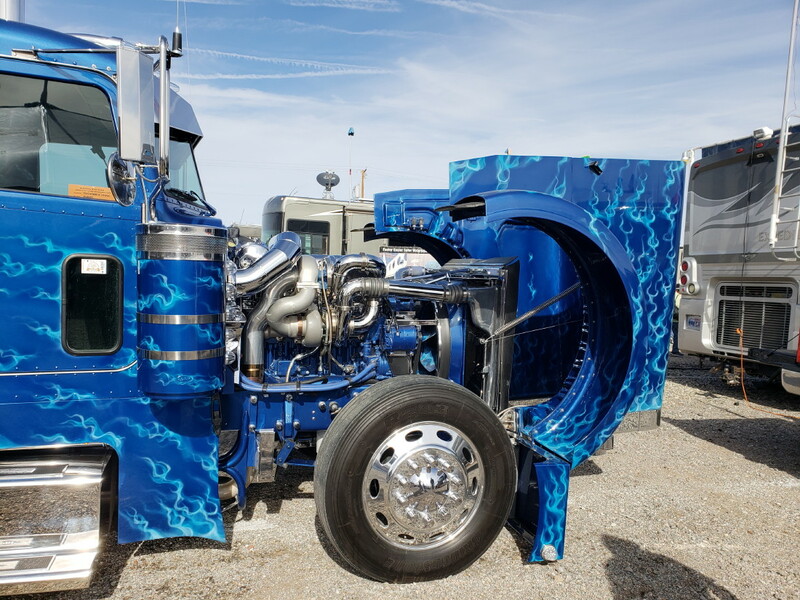 The main idea of the vendor was displaying some very large and polished diesel engines. The link below is to a very thorough walk through of a Hymer. While we are on newer RV models, let us throw out another design. Jan and I keep looking at trailers that we might set up---down the road a ways---in a campground on a more permanent basis. 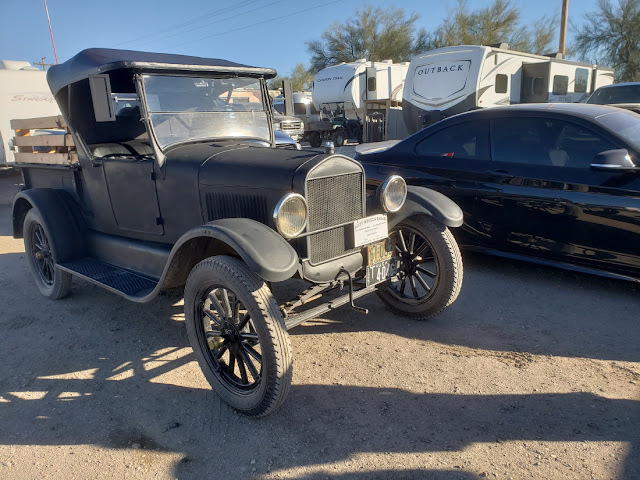 For example , we might--in 5 years more or less-- decide to place a trailer in the Northeast for summers and keep Lady Blue for use in the South for winters. Who knows???? 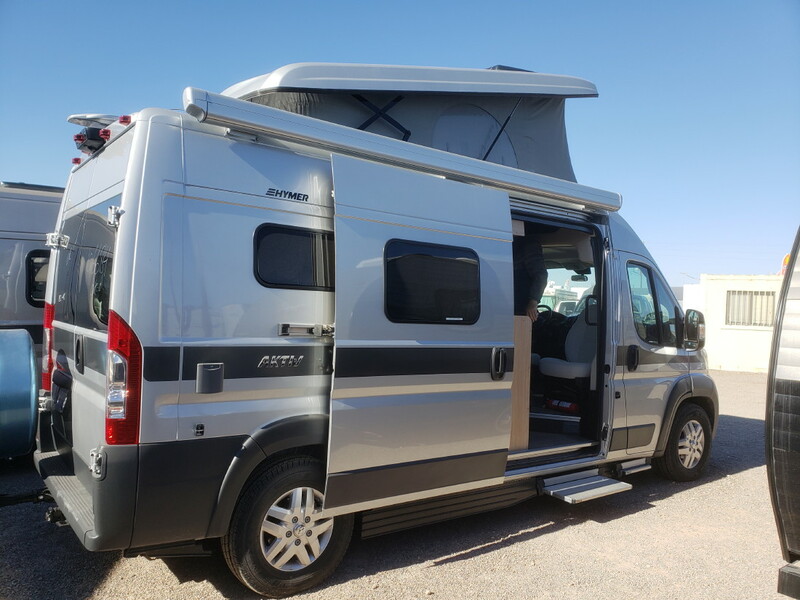 So, it feeds one of my favorite pastimes of looking at newer RV's to see what has changed. 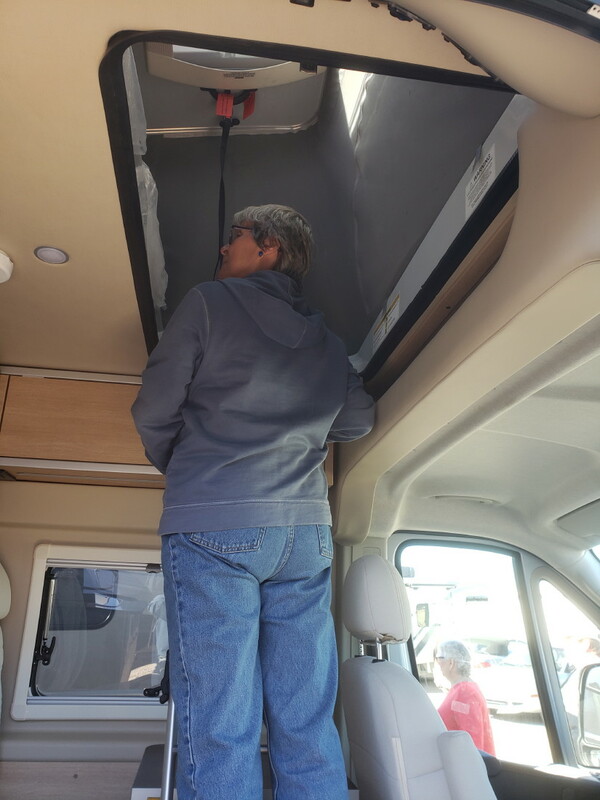 This year we looked at a number of Travel Trailers that would provide a good sized summer comfort. For instance the following link is to Grand Design manufacturer and a lighter model called Imagine about 30 feet long. Once on the website, click on the Gallery and then click on each picture to see. What we like--Comfortable seating, including ample room for family and friends , full sized refrigerator, kitchen island with good amount of prep room, walk around bed, good storage. 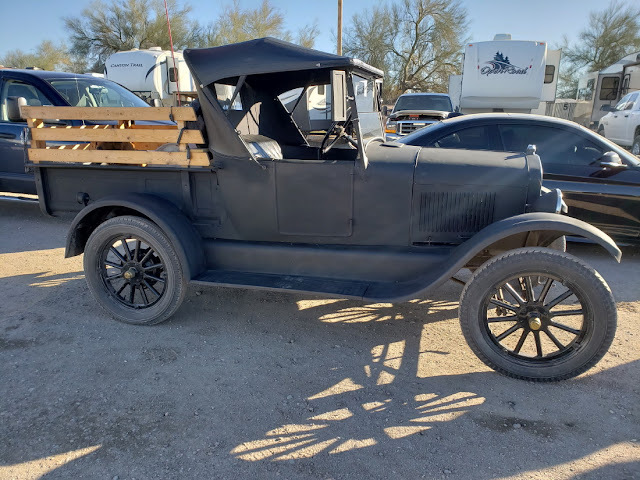 How about a 1927 Ford pickup? There were 3 or 4 of these Vixen motorhomes. 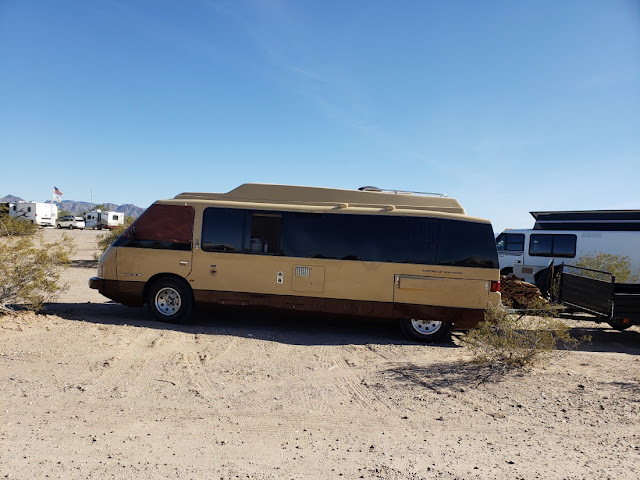 These are rare motorhomes made in Pontiac , Michigan from 1986 to 1989. Similar in some way to the classic GMC motorhomes of the 1970's . also from Pontiac( we had shown the GMCs in our blog from this past summer --here is a link to that blog posting GMC 1970's motorhomes link ), but not as tall. 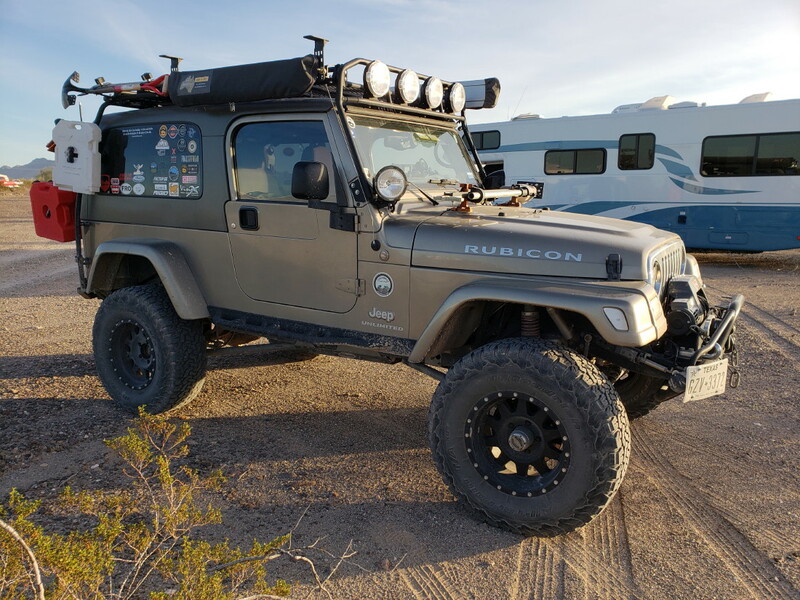 One of our Lazy Dazers, Bob, owns this boondocking Jeep. I always love to check what's new and take pictures. 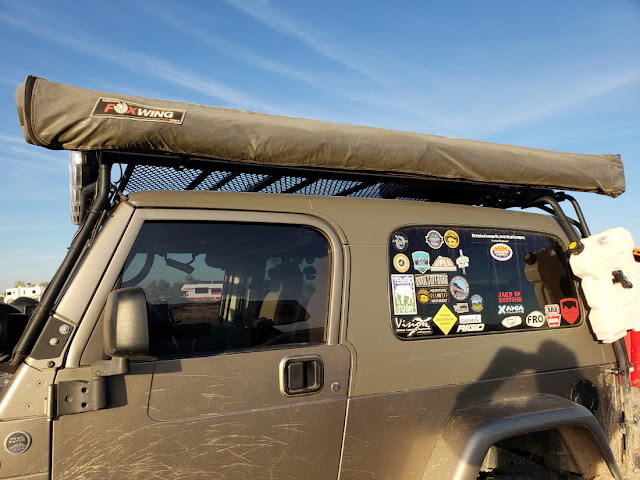 Bob is a dedicated member of the Chuckwalla Jeep Club. They love to travel the off road trails in the Southwest. Note the shovel on the roof, a shower bag, water jug, and adjustable spotlight. A link to pictures from 50 years ago in the Chuckwalla Club. 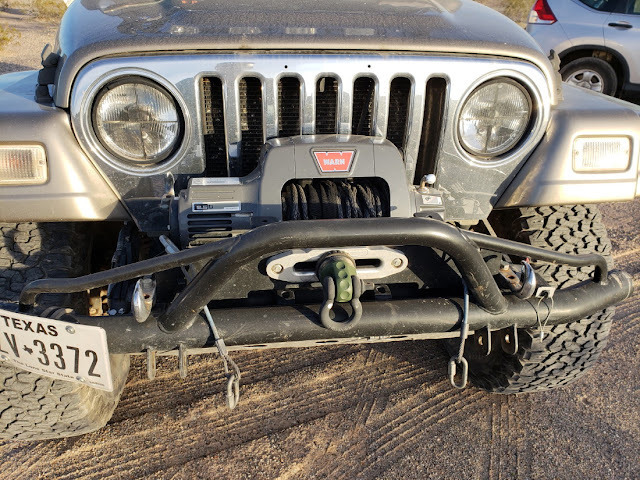 Some of the additions to Bob's Jeep. 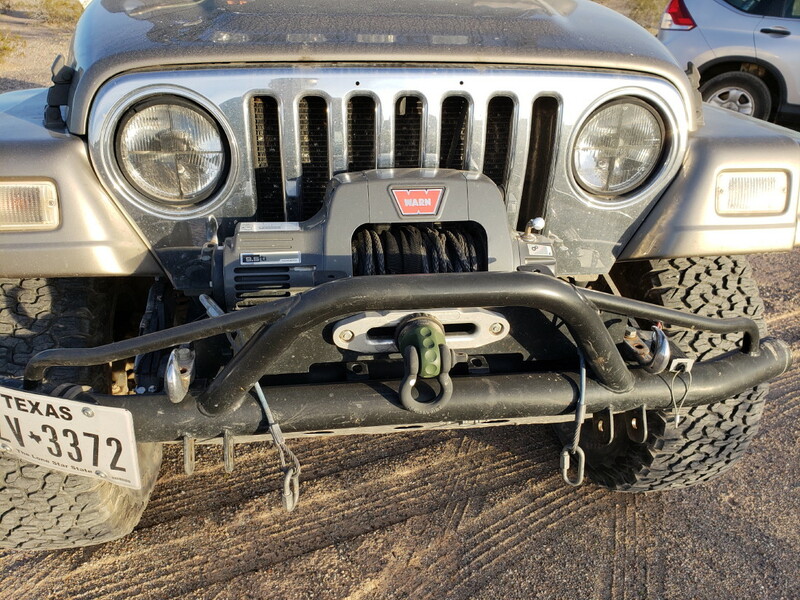 A heavy duty bar and winch. We asked Bob how often he gets stuck. He answered "never", but he is always saving ATV's and novice 4 wheelers who do not plan ahead or are not at all careful. 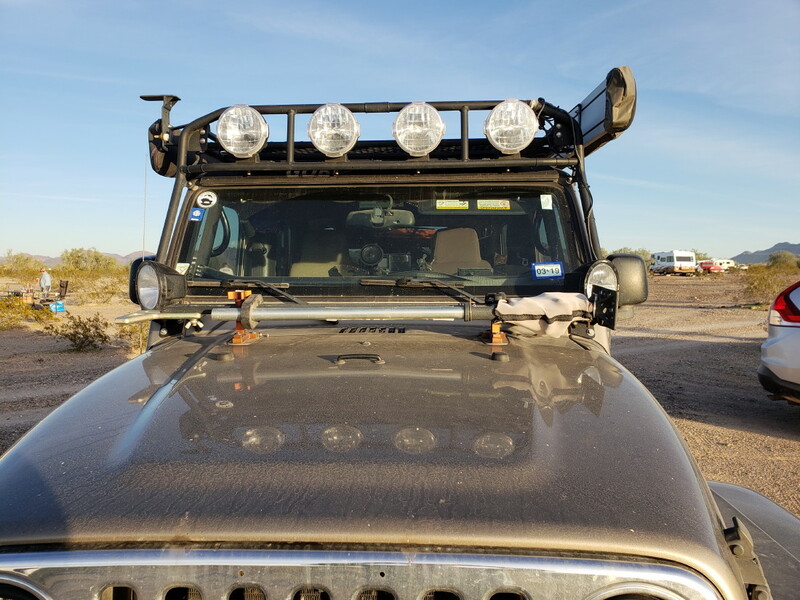 Note 4 powerful spotlights and a jack secured to the hood. An awning is also attached to the roof rack. 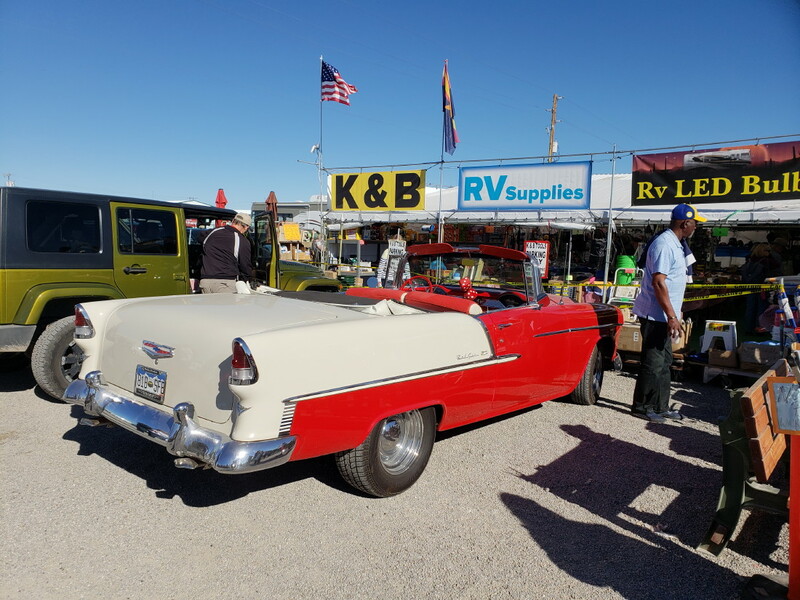 Bob mentioned that he also has a trailer that he takes on some long off road travels. The trailer has a tent. 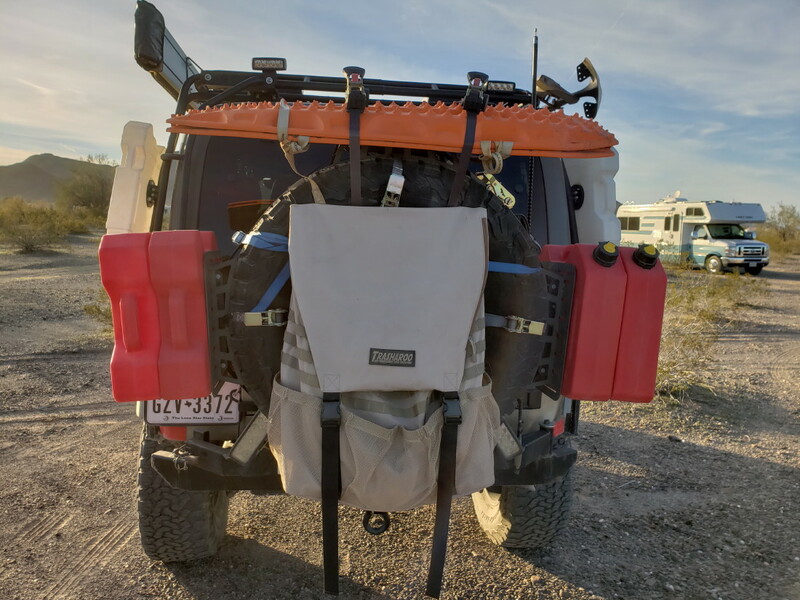 On the back are orange plastic skid boards for getting out of soft sand, gas cans, trash bag(the group is very environmentally friendly), spare tire, and more. 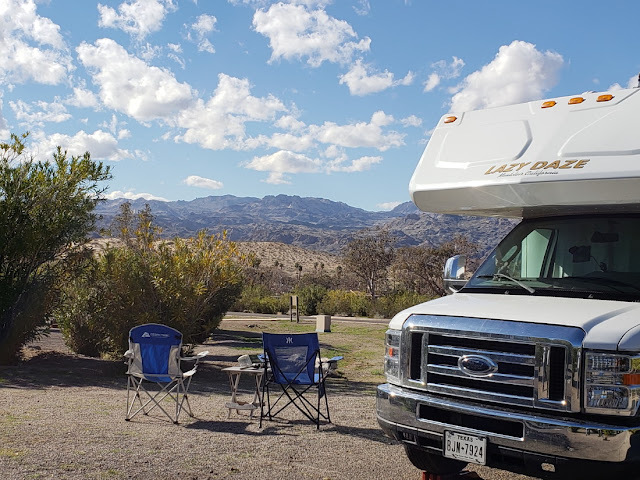 A picture of Lady Blue at Midland LTVA BLM land in Blythe, California. We had never been here, but is a beautiful and quiet patch of BLM land. Back in the 1960's, this area was used as a training ground for the military. This was during the Cold War and the area became Fort Irwin. The exercises involved over 100,000 military. During the war games more than 32 lives were lost. Above is a little video of our spot at Midland. Jan and Bruce enjoying a walk and the views at Midland. 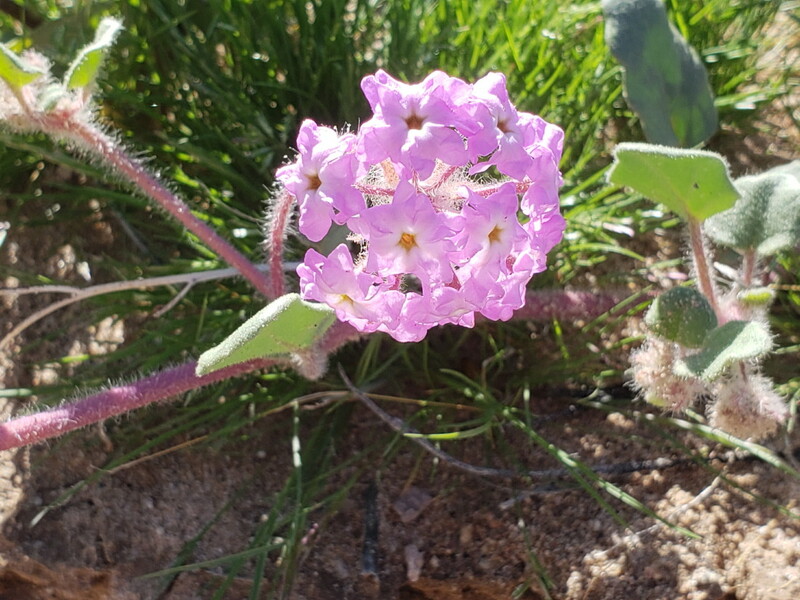 Even in early February, some of the desert plants have started blooming. 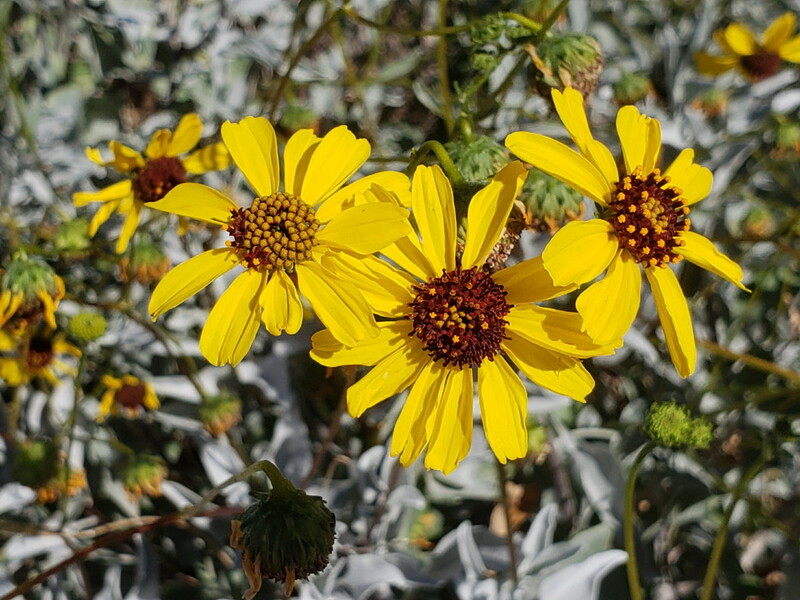 Looking like daisies, but very small flowers on the desert brush. Where are you Lady Blue? 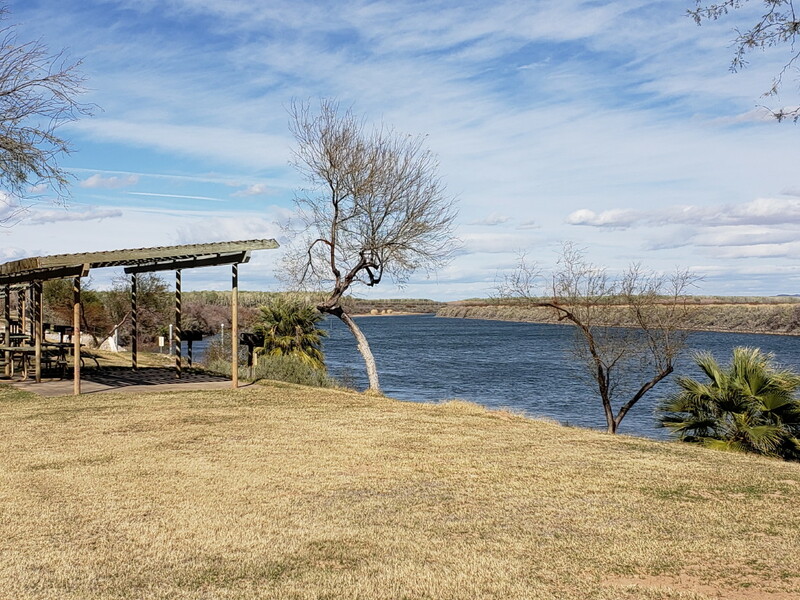 Coming out of Midland, we checked out the Mayflower County Park along the Colorado River. Not far from downtown Blythe, this dry camping section has beautiful water sites. We are in California, and Arizona starts across the river. 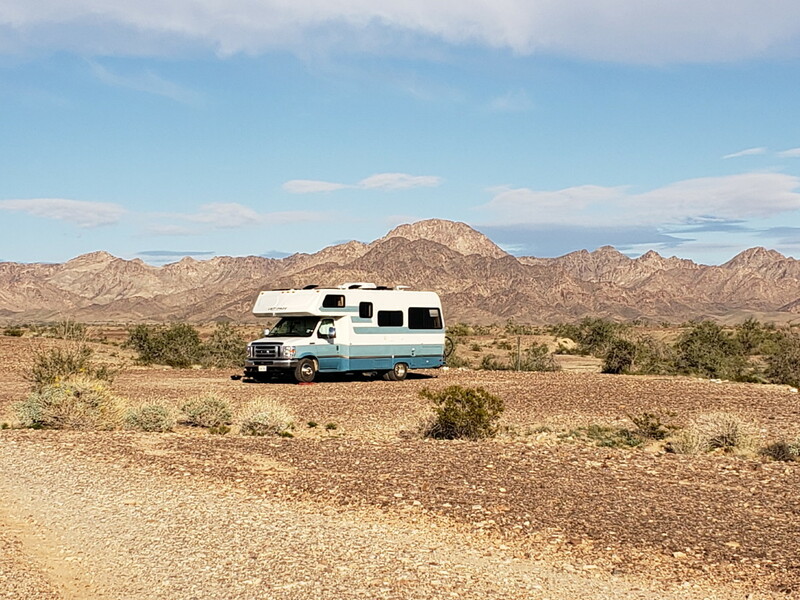 From Midland, we head north on California Route 95 to Needles. This route is quite remote. There is a sign in Vidal that indicates no services for 49 miles. And there were none for the 50 miles or so from Blythe to Vidal. We cross the line into Arizona and head north through Bullhead City with the Colorado River on our left and then towards Davis Dam on route 68 . We are back at one of our favorites, Katherine Landing National Park Campground. 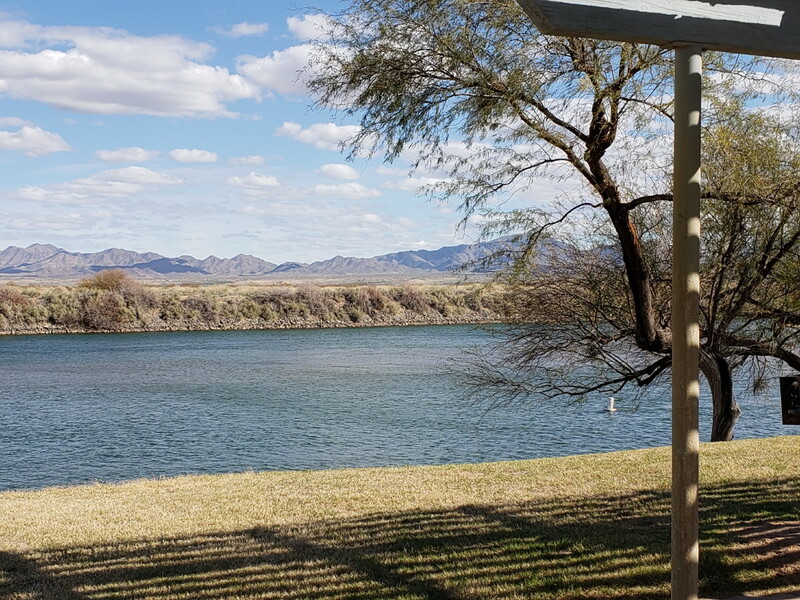 Part of the Lake Mead National Recreational Area. This is one of 7 National Park Service campgrounds from here , above Davis Dam, to Boulder City above the Hoover Dam. The campground is dry camping and is $10 per night with our Senior Pass---cash only--no credit cards or checks. This map helps a bit. You can see Katherine Landing at the bottom. This section is known as Lake Mohave. 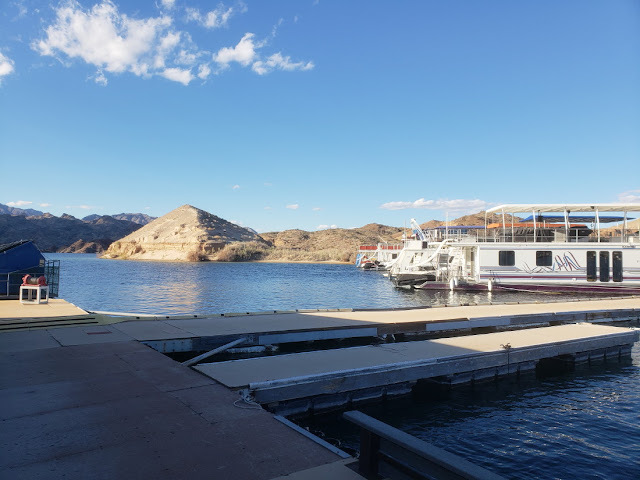 Then it is a 60 mile trip up to the Hoover Dam( which makes this a popular spot for houseboats, fishing boats, and speedboats). There are a lot of coves and stopping points on the way up to the Hoover Dam. Lake Mead starts at the Hoover Dam(where you see Boulder Beach in large letters) . 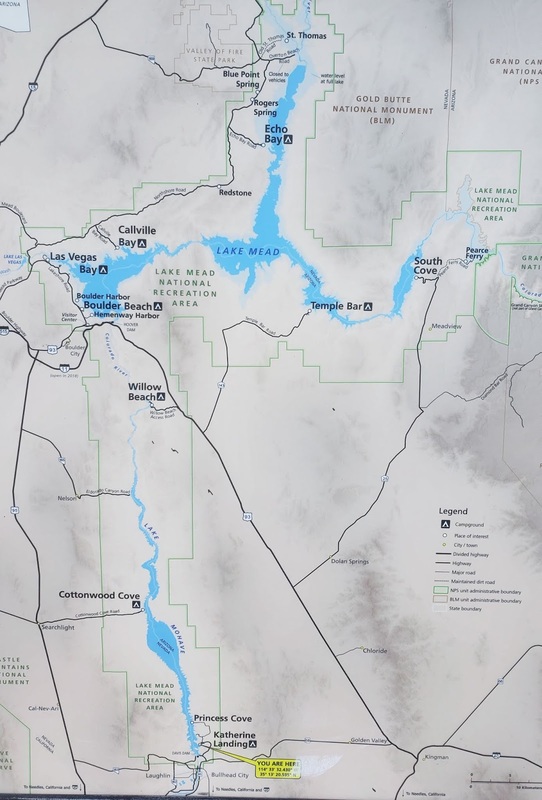 Lake Mead stretches north and east. But the Colorado River only stretches east from there to where you can see the small letters for Grand Canyon National Park. The river actually heads south for a little bit and then north through the Grand Canyon. A quiet little marina now. But we understand this marina is quite busy and sometimes noisy come Spring. One thing we never noticed before. A gentleman at the marina pointed out the mountain called Indian Mountain. We actually could see it from our campsite. If you look towards the mountain, you see the white necklace on the left. the figure is on its back, so you see the chin first, then the mouth, nose , eyes, and headdress.